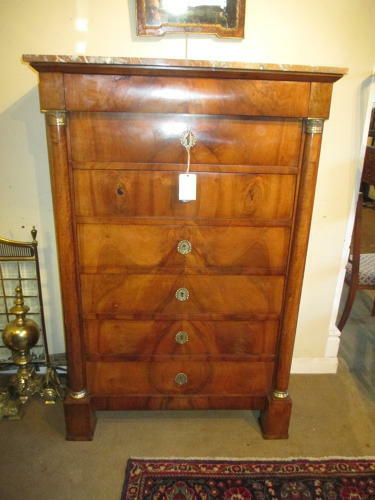 A very attractive French Semainier Commode or chest from the Empire period in figured walnut, with the usual seven drawers ( one for every day of the week) , flanked by columns with bronze decorated capitals, and matching escutcheons on the drawers, with a grey and pink marble to the top. All in excellent condition with all drawers running well, and original key. Wonderful warm colour only needing a clean and wax in our workshop.